Ready to Race for the Camden Crawl 2010? - Early Bird Tickets Announced! Only just recovered from this year's festival season? Mouth all dry and eager for more? Are you nuts? Of course you are, you love it. 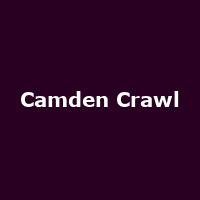 Camden Crawl 2009 was such a success that next year's tickets are going on sale nice and early. Prices are to be confirmed but the date for the first batch of "Early-Bird" tickets go public on Thursday 29th October at 9am. The first 1,000 purchasers will receive a limited edition CD featuring Camden patrons and residents such as Graham Coxon, Kitty Daisy & Lewis and Ou Est Le Swimming Pool?. £2 from each purchase will be donated to the War Child charity. 2010 will see the Crawl hit North London's most (in)famous High Street on the first May Bank Holiday Weekend, Saturday 1st May and Sunday 2nd May, running from midday until 4am on each day, including a variety of bands, singers, performers and loads of pubs. The first wave of line-up announcements will be made in January 2010 - watch this space!